Repairs & ServiceWe'll make it right. ApplicationsSee what we can do. HOUSTON, TEXAS – ACFM, Inc. ships 11 Roots™ Blower Packages to Nova Chemical’s Joffre Canada site. The R3 project is an expansion to the existing complex and is part of a $900 million dollar investment. The new reactor in the expansion is designed to produce 950 to 1,100 million pounds of Linear Low Density Polyethylene (LLDPE). The blower packages are used in the pneumatic conveying of plastic pellets is various areas of the plant. 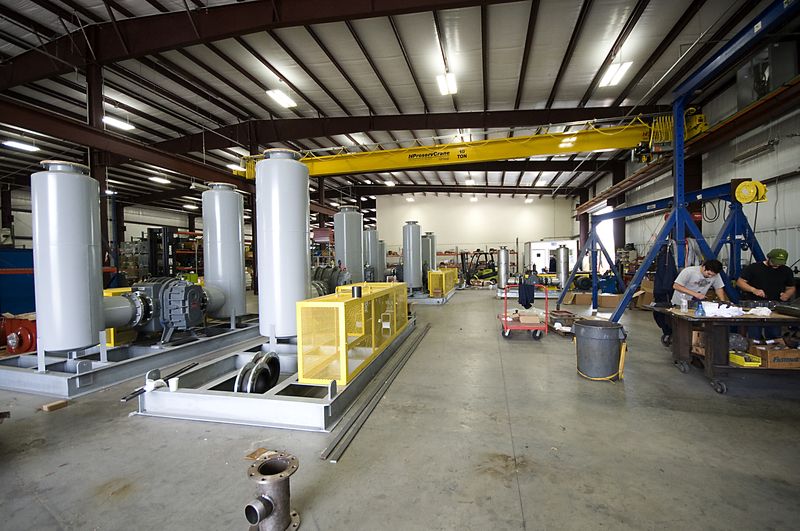 ACFM worked closely with Nova’s selected engineering firm and pneumatic conveying system supplier to build these 11 custom engineered Blower packages ranging from 5 HP to 400 HP. All packages will reside in custom built heated noise enclosures to ensure optimum operation in the cold Alberta climate. This project was built in ACFM’s new facility which just celebrated its first Anniversary. ACFM has supplied Roots Blower packages for several pneumatic conveying projects and also provides Roots packages for Process Gases and Waste Water Treatment. For more information on custom blower packages, please click here or call us at 936-539-5252.